The May 2017 Greater Atlanta Coin Show packed the bourse with dealers and their showcases filled with numismatic and collectible treasures for the many visitors to browse, buy, sell or trade. This month our visitors came in spurts - the show would be busy with heavy traffic, that group would leave and it would be a while before the next group filled the aisles. That's okay, we appreciate all of our visitors regardless of when and how they arrive. Of course, we also appreciate our dealers, our security and the hotel's staff for their assistance in making the show a success. For May, a few of our regular dealers had schedule conflicts and visiting dealers took their places on the bourse. 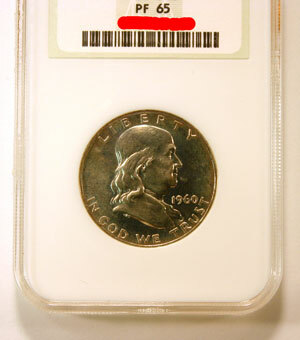 We extend a welcome to these dealers, our appreciation for their joining us and our hope that they had a good coin show. As for the hotel, it was not as busy as last month nor was the parking lot packed with 18-wheelers. A couple of churches held their services downstairs while golfers enjoyed the 18 holes behind the hotel. The hotel hosted other events as well, but they did not have the scale of attendance to fill the parking lot or the hallways like last month. The show occurred on a beautiful blue sky day after rain the night before. The sun shone with breezes that kept the temperatures in the high 60s, low 70s. Was this blackberry winter? Or, perhaps it was one of the other "winters" that occur in springtime. Now, I'm from the north Georgia countryside and am only familiar with blackberry winter, which, in general, is unseasonably cool temperatures when the blackberry briars are blooming. But, there are other "winters" in the south, such as Redbud, Dogwood, Locust, Whippoorwill and Britches. The Redbud, Dogwood and Locust winters would occur when those trees are blooming. Whippoorwill is for a cool spell that is not really cold. Britches, on the other hand, is for temperatures in May that are cold enough to wish for long johns or long britches. All these years of spring "winters" and I called them all blackberry. On the bourse, people discussed the metals' markets and how the French election might impact the prices of the precious metals. Some dealers in metals closed their trading early on Friday in anticipation of strange results in the prices after the election on Sunday. After the fact, the metals did not dramatically react to the French election results, however they have dropped in the past few weeks from their highs in mid April. The French election did not stop visitors to the coin show from searching for their particular treasures. Let's virtually look at some of their interests in May. As is usual, people looked for silver, some for bullion and others for specific coins. 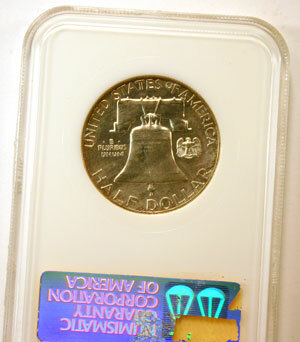 In particular, they looked for early BU Franklin half dollars with full bell lines. BU stands for "Brilliant Uncirculated" and is a generic term for uncirculated coins retaining their original mint luster. Once graded, BU coins will usually have a Mint State (MS) number of 60 or higher. "When the bottom set of lines across the Liberty Bell is complete and uninterrupted, a regular-strike Mint State 60 or above Franklin Half Dollar receives the designation Full Bell Lines (FBL). If these lines are obscured by marks, strike, planchet defects, or other problems, the coin will not receive the FBL designation. "A few marks across the lines will not prevent a coin from receiving this designation, as long as the continuity of the lines is not disturbed. Multiple marks, scratches, scrapes, or other detractions that interfere with the continuity of the lines will prevent a specimen from receiving the FBL designation. "Slight incompleteness of the bell lines, immediately to the left or right of the crack that traverses the bell, will not prevent a coin from receiving the FBL designation." This Franklin Half Dollar coin is a nice specimen graded by NGC (Numismatic Guaranty Corporation) as Proof 65, however it is not designated as FBL. Next, people looked for early Lincoln cents. In 1909, the US Mint produced the last of the Indian Head cents and the first of the Lincoln cents. During the centennial year of his birth, the coin began with his portrait on the obverse and wheat ears on the reverse. "Matching the other new silver designs of the time, the quarter depicts Liberty seated on a rock, her left hand holding a liberty cap on a pole and her right holding a shield inscribed LIBERTY. "Thirteen stars are around the upper border, and the date is below. "The reverse is somewhat similar to the preceding design, except the denomination is now expressed as QUAR DOL. instead of 25 C and the eagle is a bit heavier looking with a shorter neck and body. There is no motto on the reverse." He continued with mentions of the different varieties. This image courtesy of CCF Numismatics shows Variety 2 produced in 1853. "The penny in this image is part of a camera calibration target on NASA's Mars rover Curiosity. The Mars Hand Lens Imager (MAHLI) camera on the rover took this and other images of the MAHLI calibration target during the 34th Martian day, or sol, of Curiosity's work on Mars (Sept. 9, 2012). "The image was acquired with MAHLI at a distance of 5 centimeters (2 inches). MAHLI can acquire images of even higher resolution and can be positioned as close as 2.5 centimeters (about 1 inch); however, as this is the first checkout of the robotic arm, it was decided not to attempt to place the MAHLI at its closest focus distance during this test. "The image shows that the calibration target has a coating of Martian dust on it. This is unsurprising - the target was facing directly toward the plume of dust stirred up by the sky crane's descent engines during the final phase of the 6 August 2012 landing. "The penny is a nod to geologists' tradition of placing a coin or other object of known scale as a size reference in close-up photographs of rocks, and it gives the public a familiar object for perceiving size easily when it will be viewed by MAHLI on Mars. 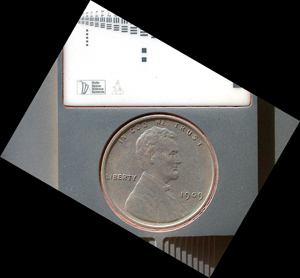 "The specific coin, provided by MAHLI's principal investigator, Ken Edgett, is a 1909 'VDB' penny. That was the first year Lincoln pennies were minted and the centennial of Abraham Lincoln's birth. The VDB refers to the initials of the coin's designer, Victor D. Brenner, which are on the reverse side. Brenner based the coin's low-relief portrait of Lincoln on a photograph taken Feb. 9, 1864, by Anthony Berger in the Washington, D.C. studio of Mathew Brady." Last on our list for this month are some early mint sets. "United States Mint Sets are a fairly recent innovation, making their first official appearance in1947. Prior to that time, collectors could obtain Uncirculated examples of our nation's coinage by applying directly to the Mint, either in person or by mail. "However, by 1947, requests for Uncirculated coins had become so frequent that the Treasury decided to standardize the process and issue official Uncirculated coin sets in official packaging. Thus, the U.S. Mint Set was born. "From 1947 to 1958, Mint Sets contained two of each coin issued, so that collectors could display the front and back of each coin. 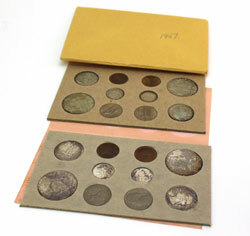 This practice was discontinued beginning in 1959, when only one of each coin was included in the set. "In that same year, the packaging was changed from heavy cardboard (into which the individual coins were inserted) to a pliofilm package that protected each coin in its own individual compartment." 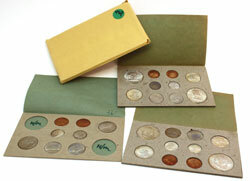 The 1948 Mint Set has two of every coin from Philadelphia, Denver and San Francisco. However, San Francisco did not produce the half dollar coin, so those cells were blank. 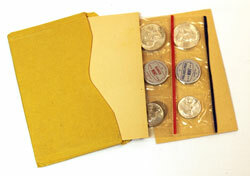 The 1957 Mint Set only had two sets of two coins since the San Francisco mint had closed its operations. The 1959 Mint Set shows the introduction of the new packaging, which would help prevent the damaging exposure to the coins as seen in the earlier examples. As always, the May Greater Atlanta Coin Show offered visitors a wide variety of numismatics and other collectibles - many more than the few mentioned above. In June, the coin show's bourse will be filled with dealers and their showcases containing coins, bullion, currency, exonumia, and other collectible items. Join us on Sunday, June 4, 2017, to see the new, old, and interesting numismatics and collectibles on the coin show's bourse. People at the show also searched for Liberty Seated Quarter coins. 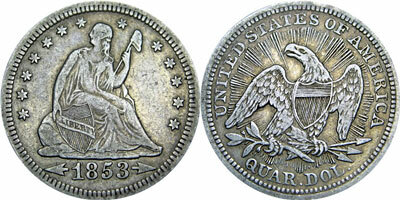 The US Mint produced the Liberty Seated Quarter coins from 1838 to 1891 with multiple varieties through the years. "Gobrecht’s Liberty Seated design made its appearance in the quarter dollar denomination in 1838.